Which currently promoting boy group title song goes best with the 'Shoot Dance'? If you watched music shows last week, you might have recognized different boy groups doing the same dance move and thought, "Didn't I watch this already?" The answer is no! Actually, what's happening is that the 'Shoot Dance' craze that began with BlocBoy JB & Drake's "Look Alive" has infected even the world of K-Pop, and now all the male idols are doing it! 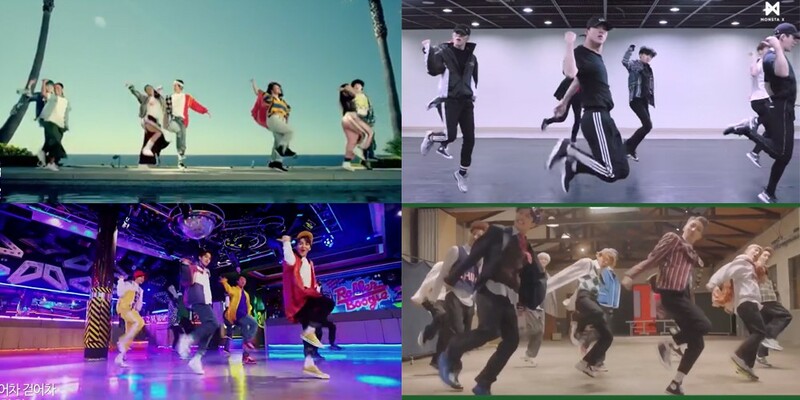 The dance has traveled by word of mouth (and various 'Shoot Dance Challenge' videos on YouTube) to K-netizens, who noticed four different male idol teams from last week's music shows doing the 'Shoot Dance' in the middle of their title song choreography. So which currently promoting boy group title song goes best with the infamous 'Shoot Dance'? Netizens opinions included, "It goes well with Pentagon's song", "Pentagon! At first I wasn't used to it but now it's cute! ", "BSS is a cute little bounce, MONSTA X look like they're coming at you at 200km/hr, and Pentagon is so thumpity thumpity keke", "MONSTA X version is so rough keke", "BSS's mood is the best! ", "EVERYDAY sticks like glue", "I love the Pentagon version, so refreshing", "EVERR DAY DAY EVERR EVERR DAY~ WITME WITME~", and more! Which song do you think goes best with the 'Shoot Dance'? Also, check out the original MV below!